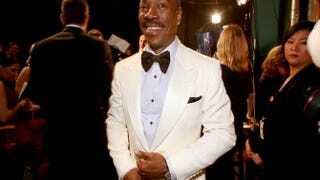 This fall Eddie Murphy will step into the limelight once again, and hopefully give a speech longer than 72 seconds, when he receives the Mark Twain Prize for American Humor. Murphy, 54, will be honored at the Kennedy Center in October during the 18th annual gala. The Kennedy Center said that Murphy was the "the most commercially successful African-American actor in the history of the motion picture business, and is one of the industry's top-five box-office performers overall." Murphy, who recently made an appearance on Saturday Night Live’s 40th-anniversary show, joins previous honorees such as Richard Pryor and Whoopi Goldberg.